Do you always lose notes jotted down on small pieces of paper? This project not only will help you keep them organized, but it will add a touch of whimsy to a room's decor. If your decor doesn't go with purple, that's fine. Use any color of buttons desired. You also don't have to match the ribbon to the buttons. For example, make a black-and-white pin board with alternating black and white buttons and ribbons, or use all black buttons and all white ribbons. Yellow ribbon looks nice with the purple buttons, or use yellow and black for "bee" decor. 1. Place the corkboard flat on a work surface. Put the buttons in the bowl to keep them neat and organized. 2. Squeeze a dab of glue onto the bottom right corner of the corkboard. Press a large button face-up into the glue so the button is overhanging the bottom and right edges. 3. Glue and press an additional button of equal size above and to the left of the first button. 4. Glue and press three smaller buttons above the vertical buttons. Glue and press three smaller buttons to the left of the horizontal buttons. 5. Measure and cut 16 inches of ribbon. 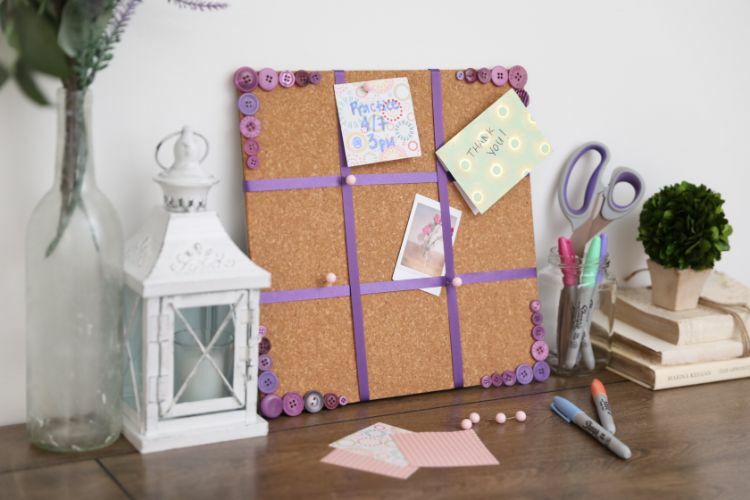 Place it horizontally 4 inches from the bottom of the corkboard, with 1 inch of ribbon hanging off each side. Hold the ribbon in place and turn over the corkboard. Glue the excess ribbon to the back of the corkboard. 6. Measure and cut 16 inches of ribbon. Place it horizontally 4 inches from the top of the corkboard, with at least 1 inch of ribbon hanging off each side. Hold the ribbon in place and turn over the corkboard. Glue the excess ribbon to the back of the corkboard. 7. Measure and cut 16 inches of ribbon. Place it vertically 4 inches in from the left side of the corkboard, with at least 1 inch of ribbon hanging off each end. Hold the ribbon in place and turn over the corkboard. Glue the excess ribbon to the back of the corkboard. 8. Measure and cut 16 inches of ribbon. Place it vertically 4 inches in from the right side of the corkboard, with at least 1 inch of ribbon hanging off each end. Hold the ribbon in place and turn over the corkboard. Glue the excess ribbon to the back of the corkboard. 9. Squeeze a dab of glue on the bottom left corner of the corkboard. Press a large button face-up into the glue so the button is overhanging the bottom and left edges. 10. Glue and press an additional button of equal size above and to the right of the first button. 11. Glue and press three smaller buttons above the vertical buttons. Glue and press three smaller buttons to the right of the horizontal buttons. 12. Squeeze a dab of glue on the top left corner of the corkboard. 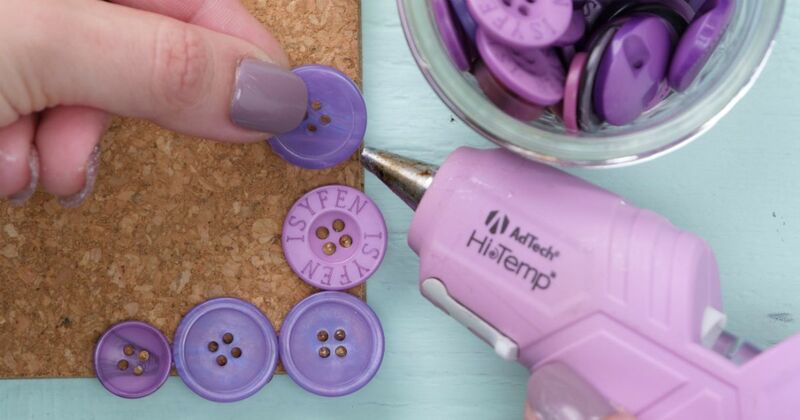 Press a large button face-up into the glue so the button is overhanging the top and left edges. 13. Glue and press an additional button of equal size below and to the right of the first button. 14. Glue and press three smaller buttons below the vertical buttons. Glue and press three smaller buttons to the right of the horizontal buttons. 15. Squeeze a dab of glue on the top right corner of the corkboard. Press a large button face-up into the glue so the button is overhanging the top and right edges. 16. Glue and press an additional button of equal size below and to the left of the first button. 17. Glue and press three smaller buttons below the vertical buttons. Glue and press three smaller buttons to the left of the horizontal buttons. 18. Prop up the corkboard on a desk or kitchen counter top.